If you think Hearne’s streets have too many potholes, add this to the list of reasons: the supervisor of the city’s street department was arrested on felony charges in January, and the city is still paying his annual salary of more than $37,000 per year while he sits behind bars. Natividad Alex Rodriguez, Jr. was indicted on a felony charge of driving while intoxicated in 2012 and he was later placed on probation, but he was arrested again in January after his probation was revoked. 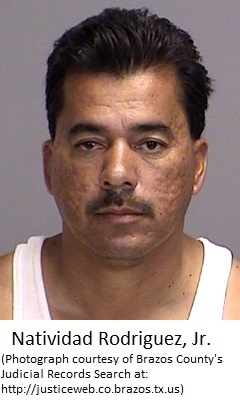 According to the 2012 indictment, Rodriguez was convicted of misdemeanor DWIs in 1993 and 1996, then convicted of a felony DWI in 1999. According to other Brazos County records, Rodriguez was also sentenced in 1999 to seven years in prison for second-degree felony possession of a controlled substance. His criminal record in Brazos County dates back to 1988, when he was arrested for assault and reckless conduct (he was later convicted on both charges). My sources tell me that prior to Rodriguez’s latest arrest, other city employees were upset that Rodriguez was allowed to drive city vehicles on the job while his license was suspended. So how does Rodriguez get away with things that would get anyone else fired? He’s a FORG, i.e., a “friend of Ruben Gomez,” the mayor. Speaking of payroll records, I’m told the mayor has decreed that the city will not be releasing any more records, never mind what the Texas Public Information Act says. On July 29, I blogged about how the city manager’s official credit card had been used to purchase hundreds of dollars worth of football tickets, among other things. I obtained those records from my client, Rodrick Jackson, and he had obtained them from the city via a public information request. After I posted the records on this blog, investigators for Robertson County District Attorney Coty Siegert started serving grand jury subpoenas for city financial records. Not surprisingly, this made some city officials very nervous, including Mayor Gomez, City Manager Pee Wee Drake, and City Secretary Ana Florida. You may recall that on July 21, 2015, the day that Mr. Jackson filed a public information request for utility billing records, city officials shut off the electricity to his house. More than a month later, Mr. Drake and Ms. Florida are still refusing to produce the utility billing records, even though City Attorney Lonnie Gosch told them they are legally obligated to release the records. I have already spoken with Mr. Siegert, the DA, about the city’s ongoing refusal to comply with the Public Information Act, because each violation is punishable by 30 days to six months in jail, but there’s obviously a bigger issue at stake. Mr. Drake and Ms. Florida may be risking jail time in the hope of avoiding prison time. Why? Because if city officials tampered with utility bills to punish their enemies, and particularly if they siphoned off the proceeds for themselves, they could be charged with felony mail fraud for each time they put an altered utility bill in the mail. In other words, they could be sentenced to twenty years in federal prison for every altered utility bill that was placed in the mail. If city officials don’t like being investigated by Mr. Siegert, just imagine how much they’ll like being investigated by the FBI, the IRS, or the Postal Inspectors. I was shocked to learn that you plan to rehire Rusty Russ as city attorney. All three of you have acknowledged that Rusty is a crook, so what does that say about you if you are trying to rehire him? Rusty, Ruben Gomez, and Pee Wee Drake have played the three of you for suckers, and if you think Rusty can save you, you are making a serious mistake. Rusty, Ruben, and Pee Wee will not hesitate to sell you out when the opportunity presents itself. The financial crimes at city hall are being uncovered, and the house of cards is going to fall sooner rather than later. I have already notified the district attorney of evidence that the decision to fire Lonnie and hire Rusty has already been made, and that would necessarily mean that you made that decision outside of a council meeting. According to Section 551.143 of the Government Code, you could be punished by 30 days to six months in the county jail for conspiring to violate the Open Meetings Act, i.e., by making the decision to hire Rusty outside of a council meeting. You have already destroyed your reputations in the community, and the longer you persist in doing wrong, the longer it will take to rebuild your reputations. I urge each of you to resign from the city council immediately. At its next meeting, the council will decide whether to replace Mr. Gosch with Mr. Russ. If the three council members want to send Mr. Russ to face me in court, I welcome that. But if they think Mr. Russ can save them, they should ask themselves whether he was able to save former DA John Paschall or former City Councilwoman Maxine Vaughn. Incidentally, Mr. Paschall’s criminal trial is scheduled for February, and the state bar hearing to determine whether he should be disbarred is scheduled for December 16, 2015. Mr. Jackson is your client? Does he have a law suit against someone? Are you the attorney that’s working on the divorce papers he’s filing? If so, will I be entitled to any monetary gain being that we are still married? I’m just curious. It takes 2 council persons to have something put on the agenda. I say lets urge 2 to put all the issues on the agenda and lets see where all 5 and the mayor stands. Ty I am 100% certain Lashinda White doesn’t have anything to do with Rusty Russ being rehired. It is of my opinion that there was and has not been a meeting of any majority of the council to discuss or make a decision outside of a council meeting concerning Rusty. I am not certain that it may not have been mentioned by one or even two people, but NOT a majority. I can say that if this happens it will be of a disappointment to me! The fight to reach calm waters to be able to properly govern was tedious to say the least and I am praying that these crooks won’t be REWARDED with a path of continuance. Thank you for your fight for “Justice”! As you know my battle has been for fairness and right toward all people, not just a few. I hope the unjust is seen for their past and present corruption and justice is served!